Liz notes this as being "sharp, tangy, and saucy." Father Clifford referred to it as "big and fruity, it bowls you over." This, of course, elicited great laughter from the group because it's so true. He rightly noted the pear aroma. Randy, the great "Dessert Father," thought on this for some time. 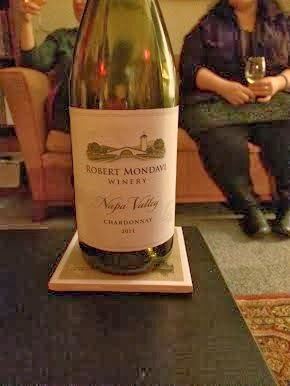 He enjoyed this wine, but doesn't know what to say: it's a good all-around wine, but he's not sure that he'd buy it again. Abba Clifford agreed with this, as the wine is not particularly interesting. Randy concluded, "Would that every glass of Chardonnay I had tasted this good." Sean bemoaned that he couldn't tell this difference between this wine and the first. We had to remind him that he hadn't yet changed wines and was still on the Fume. Clearly, this is going to be a long night.